Kultura Liberalna [Liberal Culture] is a centrist, liberal media organisation, established in Poland in 2008 by a group of journalists and academics, which publishes an influential weekly online journal featuring articles, commentary and debate. 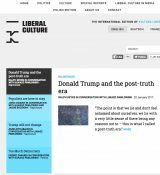 Liberal Culture also publishes books, organises international events and develops partnerships with other media outlets and intellectual networks around the globe. Our main aim is to strengthen and modernize liberal ideas in Central and Eastern Europe through the promotion of the ideals of an open society, worldview pluralism and free debate based on mutual respect. For the past six years, we have been producing a non-profit, online weekly magazine Kultura Liberalna (Read: On The Magazine) which has become the leading liberal journal in Poland. Each year, we organize numerous public debates, discussion panels, conferences and seminars. We run the Public Debate Observatory, a research institute focused on analysing the process of radicalization of language in the Polish public sphere. We work together with a number of valued institutional partners. Additionally, we provide expertise and commentary to numerous international institutions and media, which resulted in approx. 1000 public appearances in 2014 alone. We are also part of Time to Talk, a Europe-wide network of debating houses.